Lentils in themselves can be bland, but they have a marvelous quality of absorbing the flavors of supporting foods cooked with them. 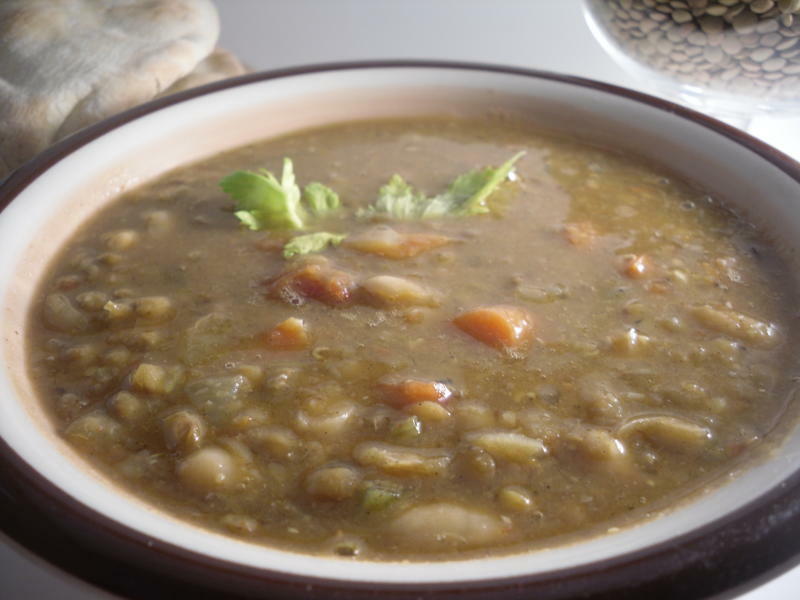 Lentils are full of vitamin B. This soup is deliciously spicy, completely vegetarian, has no cholesterol, and is high in protein and fiber. In a large pot, saute onions, garlic and ginger in 1 Tb. olive oil about 5 minutes until softened. Add water, lentils, chick peas, cannellini beans, tomatoes, carrots, celery and spices. Bring to a boil, lower the heat and simmer for 1 to 1-1/2 hours, until lentils are tender. This soup only takes about 20 minutes prep time and has all the warm, sensual spices of Morocco. Hey I just happened to see this one on the soup night blog. I'm a vegetarian and I've been lookiing for something different. I like your use of three beans in this one. Thanks for posting it. This sounds really tasty and satisfying, and I love anything with chickpeas in it! Thanks so much for sharing this recipe with Sunday Night Soup Night. I'll be hosting weekly through fall and winter, so I'd love to see you again with your next soup/stock/chowder recipe!